If you’re a writer who’s obsessed with your craft and striving mightily to get published, you probably feel a certain rage when you struggle to get through that insanely buzzed-about celebrity author “blockbuster” and then discover, by chance, an unknown thriller with a remainder mark and realize it’s one of the best things you’ve ever read. Wallowing in bitterness over such crazy serendipity is a waste of time. For the sake of your heart and your longevity you’re better off simply recognizing that publishing is a business that really is filled with lots of good people doing their best to discover great work while also figuring out how to protect their backsides. 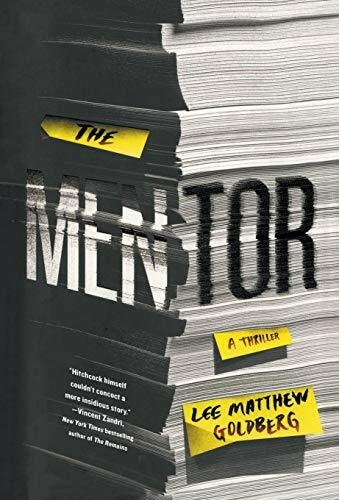 Picking up The Mentor by Lee Matthew Goldberg is another way to cope. As a reader you’ll be captivated by stunning suspense with Fatal Attraction-like thrills. As a writer you’ll relish it as a head-tripper that sometimes reads like a send-up of the publishing industry until you realize it actually isn’t nearly as over the top as some might believe. The good guy at the center of the story is a young, smart publishing executive named Kyle Broder whose career takes off when he wins a bidding war for a partially written novel by a young woman. Despite some details about the book’s appealing authenticity as a heartbreaking coming of age story, some readers might wonder how it could warrant such a high-stakes roll-of-the-dice among the Big Six (now the Big Five) publishers—a situation that accurately reflects the way such things sometimes happen in real life. Yet we immediately trust Kyle’s instincts as one of the first people to see something uniquely magical in the work. From the beginning, he’s a likeable guy and believable as an editor with strong literary and business acumen. Unfortunately, headlines about Kyle’s career trajectory draw the attention of college professor William Lansing, a villain who’s got the motivation and the means to mess up Kyle’s mind from the inside out. We know from the book jacket that Lansing is both a psychopath and an aspiring novelist who mentored Kyle as a student. In a stroke of brilliance, however, Goldberg introduces the professor by making him seem quite normal as he takes a vigorous morning walk around the college town, bringing us inside his head as he thinks seemingly ordinary thoughts about his life as a teacher, writer, husband, and father. This everyday guy persona continues as Lansing reconnects with Kyle and is introduced to his girlfriend, Jamie, over a long boozy dinner at Kyle’s New York apartment. The deceiving characterization is effective because it makes Professor Lansing initially easy to relate to—and his descent into madness all the more compelling. The first indication of that madness comes with the professor’s ardent belief that the novel he’s been writing for years is a masterwork. He then becomes obsessed with the certainty that his former student is going to acquire and market it to stunning success. It’s a yearning that many writers will easily understand, right up to the first crack in the professor’s façade. It happens after Kyle discovers the book is poorly written, filled with sickening gore, and too disturbing to even finish. For obvious reasons, Kyle tries to avoid a conversation about the manuscript . . . and for several days is taunted practically by the hour with Lansing’s obsessive demands for a response. The text messages and voice mails go from passive aggressive to outright aggressive before Kyle, in the kindest way he can muster, declines to publish the book. Which is all it takes to flip the switch in Lansing’s head, turning him from a longtime “mentor” and friend to a psycho hellbent on destroying Kyle’s life. Fans of stalker stories will find plenty to love in Lansing’s demented efforts to wreck Kyle’s relationship with Jamie and his career. Readers who relish thrillers with brisk pacing and compelling characters will rank this as one of their all-time favorite books. And people in the book business will appreciate the story-within-the story and Lansing’s outlandish plan for literary fame, which could never happen in real life—unless, just maybe, it actually does. Chris Beakey's first novel, Double Abduction, was nominated for a Lambda Literary Award. His next novel of suspense, Fatal Option, will be published in February 2017.